Problems with my Epson printer, the red and green light began flashing and a window popped up, saying, take it to your services center because some parts have reached the end of their life. Printer companies set a “protection counter” on all printers , it’s an internal counter measuring the amount of ink wasted by head cleaning. 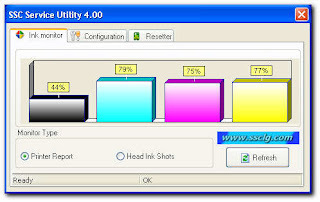 Reset the "protection counter" as well as clean the “waste ink pad overflow”. and then using a bit of force pry apart the cover. 2. Next remove the two (2) waste ink pads. screwdriver to lift up the ink pads (they were soaked). Please use rubber gloves as it gets very messy. 3. Next wash them with just plain hot water until they are white again. I just let the hot water run on them (the pads are about three inches long). not set it on fire with too much heat). 5. Once dried place the pads back in the ink waste bin at the back of the printer. & power cable and turned it on. (Yes the lights are still flashing). 8. Install the software and run it. say “YES”. Then close the window. 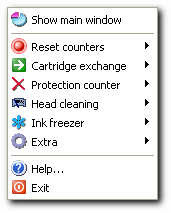 a printer icon near your clock in the task bar. 11. Then click on reset counters. You can do all other stuff with this utility too. 12. Turn off the printer power and then turn it on again. wait 20 seconds. Plug it back in.